This children's book explores the innermost workings of some extraordinary buildings and machines. From helicopters to submarines, skyscrapers to coal mines, open up a fascinating world packed with unique and detailed cutaway drawings.Whether it's a Spanish galleon or a medieval castle, each cross-section slice or exploded view reveals what's going on inside. See the people swarming inside the Empire State Building, the workers busy backstage at the opera house, and where the crew sleep on a jumbo jet. Included also are two impressive fold-outs showing an ocean liner and a steam train.There are lots of fun facts to be discovered, and curious details are highlighted and explained. Did you know one of the funnels of the Queen Mary liner was fake, and used for storing deckchairs? And in almost every scene there's the challenge to find a man on the toilet! With more than a million copies sold, Stephen Biesty's award-winning illustrated books are as fascinating today as they were when first published, in 1992. 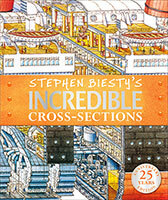 Incredible Cross Sections is the ultimate way to see how things work.This children's book explores the innermost workings of some extraordinary buildings and machines. From helicopters to submarines, skyscrapers to coal mines, open up a fascinating world packed with unique and detailed cutaway drawings.Whether it's a Spanish galleon or a medieval castle, each cross-section slice or exploded view reveals what's going on inside. See the people swarming inside the Empire State Building, the workers busy backstage at the opera house, and where the crew sleep on a jumbo jet. Included also are two impressive fold-outs showing an ocean liner and a steam train.There are lots of fun facts to be discovered, and curious details are highlighted and explained. Did you know one of the funnels of the Queen Mary liner was fake, and used for storing deckchairs? And in almost every scene there's the challenge to find a man on the toilet! With more than a million copies sold, Stephen Biesty's award-winning illustrated books are as fascinating today as they were when first published, in 1992. Incredible Cross Sections is the ultimate way to see how things work.